With the help of more than 130 member companies we have engaged with more than 35 schools on Teesside and interacted with over 6,000 young people. 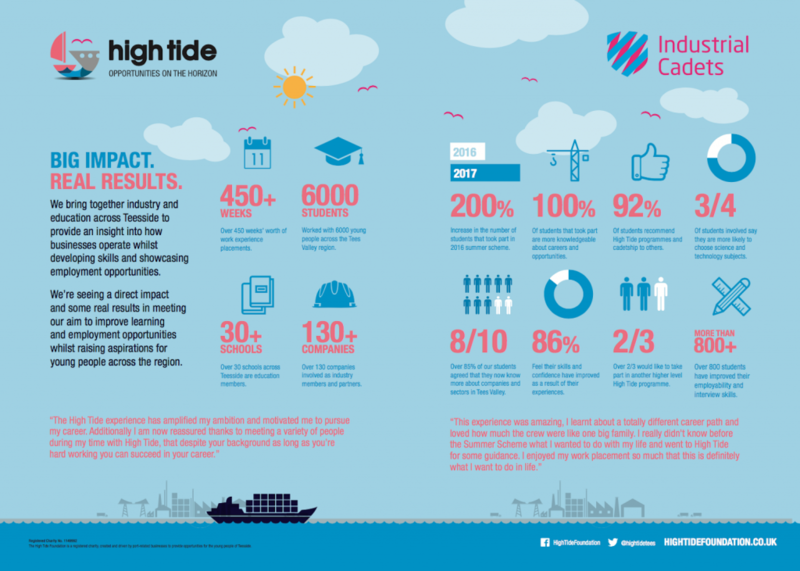 We’ve been instrumental in raising aspiration and improving awareness of career opportunities across the key business sector in Teesside. Click on our Impact infographic below for more details about how we’ve support young people in the Teesside region. All our programmes are FREE to our education members. If you are a school in Teesside and you’re interested in becoming a member and applying for any of our programmes then please get in touch with the High Tide team on 01642 233 597, drop us an email at info@hightidefoundation.co.uk or complete our enquiry form.